Sun rising over Ta Prohm, from the western side looking at the entrance towers of enclosure III. The temple complex of Ta Prohm was largely undisturbed for centuries, taken over by the jungle. Ta Prohm was used for scenes in the movie Tomb Raider. 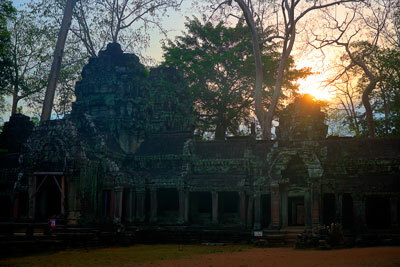 Add tags for "Sun rising over Ta Prohm, from the western side looking at the entrance towers of enclosure III.". Be the first. <http://www.worldcat.org/oclc/881167356> # Sun rising over Ta Prohm, from the western side looking at the entrance towers of enclosure III. schema:about <http://www.worldcat.org/oclc/881167356> ; # Sun rising over Ta Prohm, from the western side looking at the entrance towers of enclosure III.